Peanut Butter Rice Krispie Treats are sure to be a family favorite! This Peanut Butter Rice Krispie Bar Recipe is marshmallow-free made with brown crisp rice cereal, peanut butter, and honey. Finished with a chocolate topping, because chocolate and peanut butter are perfection together! If you love chocolate and peanut butter together as much as I do, be sure to check out Chocolate Peanut Butter Banana Sushi, Homemade Peanut Butter Cups, and Chocolate Peanut Butter Cookies. One of my earliest memories of a sleep over at a friend’s house included making homemade rice krispie treats. I remember laughing and giggling and thinking we were so grown up that her mom let us make the classic no-bake treat all by ourselves. And truly, to this day, I have a hard time resisting a soft rice krispie treat, just like I have a hard time passing up chocolate. Put the two together and an IRRESISTIBLE treat is created. You guys know I have a serious love for peanut butter already, with my Peanut Butter Banana Bars, Peanut Butter Banana Sushi, and even Peanut Butter Coffee. I also love to switch out overly processed food to make classic recipes a bit healthier. So it was a pretty obvious choice for me to lose the marshmallows in rice krispie treats and replace them with peanut butter and honey. The chocolate addition is just because everything is better with chocolate, right?! These rice krispie treats are rich with peanut butter, perfectly sweet from the honey, and gooey just like traditional rice krispie bars. They are truly spectacular–and totally better than the original recipe! Brown Crisp Rice Cereal–this can be harder to find, so regular old crisp rice cereal works, you just lose the whole grains that brown rice cereal provides. Peanut Butter–use all natural, creamy style peanut butter. You can use regular peanut butter, but keep in mind that has added oils and often added sugars. Honey–I love the way honey and peanut butter pair together and the honey helps to sweeten these bars up naturally. Dark Chocolate–melted chocolate tops off these peanut butter rice krispie bars to take them over the top, but is totally optional. Measure out the peanut butter, honey, vanilla, and a pinch of salt and mix well. Measure the rice cereal and pour into the peanut butter mixture. Stir the cereal into the peanut butter mixture until the cereal is well coated. Pat down the bars into a greased or parchment or wax paper lined pan. 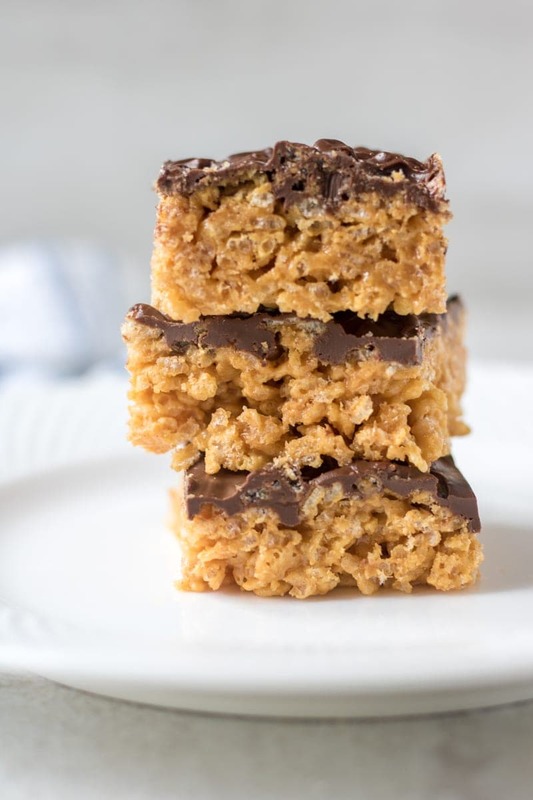 You can totally stop right there and have delicious peanut butter rice cereal bars…..or you can take the extra step to add a layer of chocolate. Melt chocolate chunks or chocolate chips in the microwave. To Melt Chocolate in Microwave: Heat on medium high for about 1 minute to start with. Remove from microwave and stir. Repeat heating at shorter intervals, 20 to 30 seconds, stirring in between, until the chocolate is completely melted and has a smooth consistency. 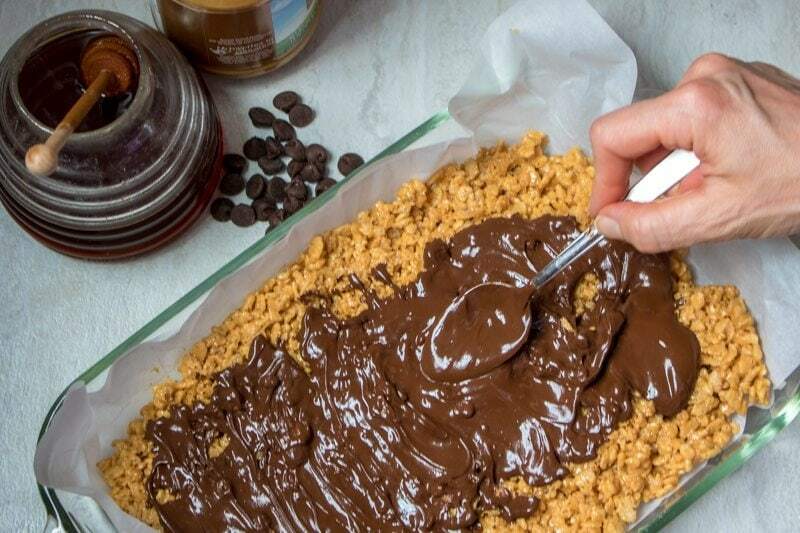 Once the chocolate is fully melted, pour over the bars, and spread to out chocolate as you would icing on a cake. Let bars cool completely and then slice into squares. Store in an air tight container for up to 4 days at room temperature. Rice Krispie Treats DO NOT freeze well. Use dairy-free dark chocolate and maple syrup in place of the honey for Vegan Rice Krispie Treats. If you don’t have parchment paper to line your pan with, grease well with butter or coconut oil. I like to use a leftover dark chocolate bar, chopped up to melt if I have it in place of chocolate chips. Be sure your crisp rice is certified gluten-free to make these Gluten Free Rice Krispie Treats. 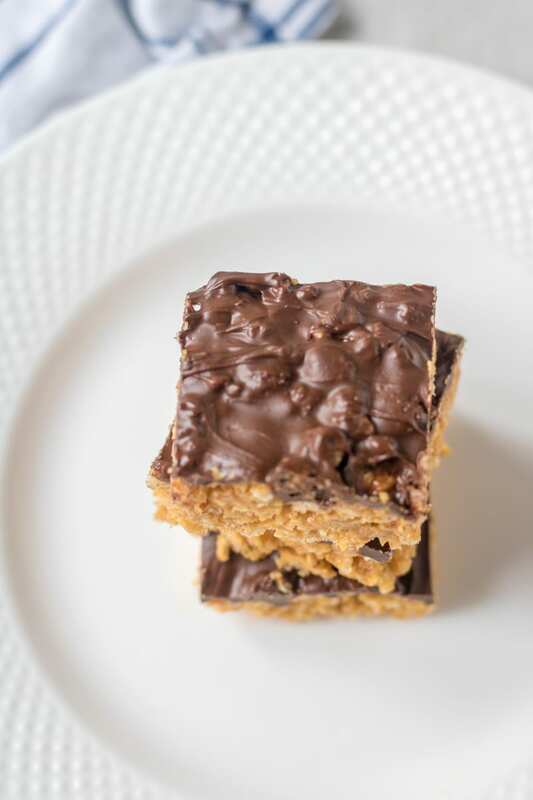 This Peanut Butter Rice Krispie Bar Recipe is marshmallow-free made with brown crisp rice cereal, peanut butter, and honey. Finished with a chocolate topping, because chocolate and peanut butter are perfection together! Cover an 8x8 pan with parchment or wax paper. Set aside. Heat honey and peanut butter up for 30 seconds and then stir in vanilla and salt until smooth. Stir in cereal until just coated. Pour into prepared pan and gently flatten out. Melt the chocolate chips in the microwave for 30 second intervals, stirring after each interval, until chocolate is melted. Pour chocolate over cereal mixture and spread out with back of spoon. Allow to set up in refrigerator for at least 30 minutes. 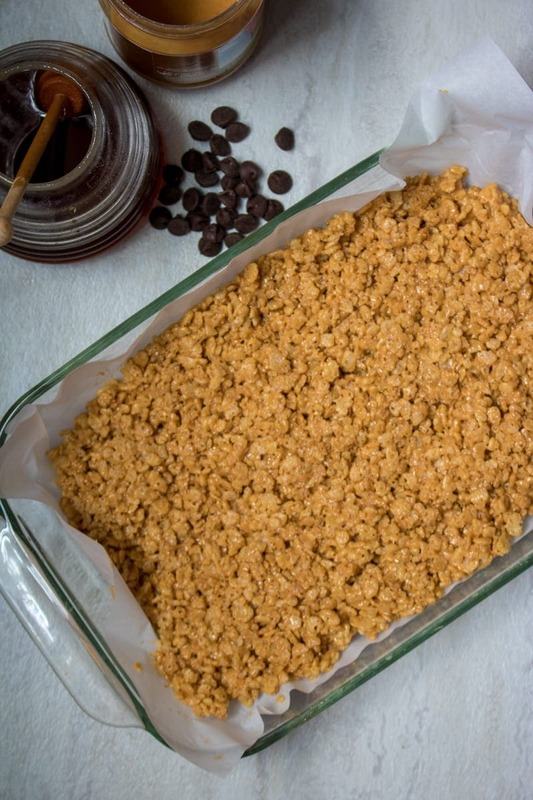 Substitute maple syrup for the honey for a vegan rice krispie treat. This looks like a great twist on a childhood (and adulthood) favorite. These look so yummy! What a wonderful healthy variation to one of my favorite desserts! Yummy! I’m definitely going to make these! Such a great idea. Thanks Monique–you will love them! Almond butter would work great! Mmmmmm. These treats could turn any day around! I love ANYTHING that combines chocolate and peanut butter. It is such a classic combo, and can’t be beat. I love this twist in combining the TWO classics of peanut butter cups and rice krispie treats. Yum! Rice Krispy treats are one of my all time favorite treats and I am always looking for new ways to elevate the flavors! Thanks for this great looking recipe!! It is the best rice krispie treat I have ever had! These would be my son’s favorite! I love the chocolate on top! Ooo, what a delicious treat! Chocolate & peanut butter are always a winning combo! P.S. love the book analogy! Trust me Catherine, these will be your new favorite!!! I could eat a pan of these treats myself!! I’m allergic to peanuts but I bet sunflower seed butter would work with these! They sound delicious! It would be great with sunflower butter! Great way to cut down on the sugar! Love it, Kristen! Thanks for linking up at #SaucySaturdays. Found you through the linkup! These look AMAZING. Must make them! I’m gluten free and would love them as much as my kiddo. I could have eaten the whole pan myself–you will love these! Yum! These sound great! Thanks for linking up to the Blogger Brags pinterest party. I have pinned your post to the Blogger Brags pinterest board. Ksenia–good catch. I updated the recipe to please vegans Enjoy–these are scrumptious!